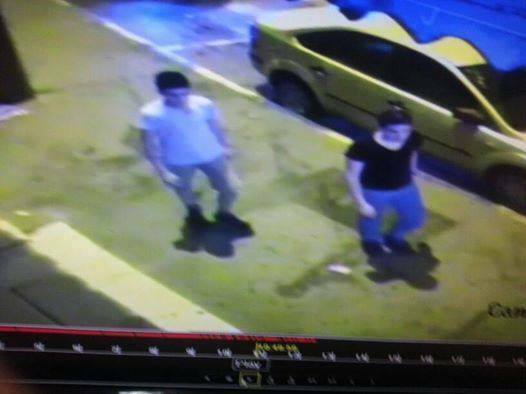 The Electronic Intifada has obtained video images showing the faces of two of the suspected kidnappers and murderers of Muhammad Abu Khudair, the Palestinian teenager who was abducted on Wednesday morning, burned alive and dumped in a Jerusalem forest. (See update below on arrests in this case). The footage comes from a security camera on the building owned by Hussein Abu Khudair, Muhammad’s father. Muhammad was kidnapped from right outside the building in an apparent racially-motivated reprisal for the killings of three Israeli teens whose bodies were found in the occupied West Bank last Monday. The video above was taken on a mobile phone pointed at a computer belonging to Hussein Abu Khudair that was playing the original video from the security camera. Israeli police were present at the time the mobile phone footage was shot and their voices can be heard in the background, but they were apparently unaware that the mobile phone video was being made. A short time later, around 6am on 2 July, just over two hours after Muhammad disappeared, Israeli police confiscated the laptop containing the original file. The video shows two young men walking in from the top left of the frame, one wearing a white t-shirt and one wearing a black t-shirt. The one with the white t-shirt is gesturing with his left hand. They then stop, at the bottom right of the frame, as if they are talking to someone who is not visible in the video, presumably Muhammad. The man in the white t-shirt continues to gesture vigorously. This still image shows their faces. Though not clear, this would likely be sufficient for authorities to identify them and the original footage taken by the police would almost certainly be much clearer. While this still image has appeared on several websites, the video above is published for the first time, here at The Electronic Intifada. The Electronic Intifada separately obtained security camera footage taken from across the road, which Muhammad’s family says shows his kidnapping. The Guardian previously published a short clip of this second video, as Bushra Abu Khdeir, an aunt of Muhammad, comments on it. These frames taken from the video, running in a short loop can be visually matched to the first clip above showing the alleged murderers from close up. In the full video, below, the men first appear at 3:50:14am on Wednesday, 2 July. Following their appearance the two men approach the spot where Muhammad was said to be sitting on the steps of the building. At 3:50:26, a car appears in front of where the men are standing. The car moves forward and then reverses. Some kind of altercation is visible and then the figures disappear into the car which moves off at high speed. Israel has placed a gag order on Israeli media reporting details of the case. Israeli blogger Elizabeth Tsurkov reported on her Twitter feed that the suspects were associated with the Beitar Jerusalem football club whose fans are notorious for anti-Arab violence and racist chants. She said that this information was reported by Israel’s Channel 10, in violation of a gag order. The 6 suspects were arrested in the early morning hours today after police managed to track the car used by the kidnappers. According to the Police, the license plate of the vehicle was never visible clearly enough in the CCTV footage. The gag-order on all other details of the investigation of Muhammad Abu Khdeir's kidnapping & murder was extended. Israeli Police wanted to hold a press conference today & reveal more details, but Shin Bet (which now holds the Jewish suspects) objected. This video should be circulated far and wide,. O sea, que los israelitas pueden ir a Palestina sin control, pero los Palestinos no pueden ir a Israel sín control, oh, órale que padre. Desde hace décadas Israel lleva a cabo una política de ocupación, violencia y apartheid. Sus acciones contra los palestinos están concebidas para aterrorizar la población civil y constituyen un castigo colectivo. Debido al apoyo militar, económico y político que recibe el estado judío de gobiernos de todo el mundo, incluso los gobiernos de España y los países latinoamericanos, viola sistemáticamente y con completa impunidad los derechos humanos de los palestinos en territorios ocupados y dentro de las fronteras de Israel. What evidence in the video supports your claim that the men knew the victim (and hence are not Israeli)? You could not be a bigger moron. The fotage shows nothing and proves nothing isreal is clearly trying to pin it on someone else!! If these are Palestinian kids, guaranteed the video will be put out by israel to "prove" their case; but since the laptop was already confiscated, if they are found to be settlers, the original video file will somehow "vanish" and israel will claim there is no evidence of the killers or their faces. His father was very smart to video this when he had the chance. It's so painfully clear israel has ZERO interest in finding Muhammad's killers. They rain bombs down on Gaza after declaring it was Hamas who killed the 3 illegal settler kids, even after Hamas said it had nothing to so with it and did not know who did (and they would proudly claim it if they HAD done it); yet when there were witnesses to this boy's abduction and now video evidence, netanyhaoo says he will launch a "full investigation" to find his killers. Which translates to "good job boys, no charges will be filed." Who feed u with lies ? first of all , the killers were already found , and under investigation . 2nd , Israel bombing in Gaza not because of the three settlers that kidnaped and murdered .... its because Hamas shooting rockets on all over the cities .